Developed by educators for educators. Over 50 educators came together and created a master 'all in one' solution that will fit the management model of almost any school. Any of the features can be customized to fit the model of any type of school or college. A new feature can also be added on request by the experience technical team. A fully functional dash board system where you can have an overview of the entire system and manage everything click by click. Manage the entire admission process, create and process application forms, computer based test, upload admission list enquiries and many more. Fully functional CBT Testing platform you can use for entrance examinations. Upload question and answers and everything becomes automatic including grading. Create multiple fee plans, receipt, invoicing, vouchers, etc. Receive and process fees online via interswitch and othe payment processors. 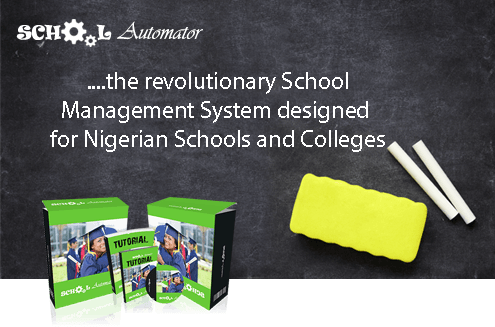 Create and maintain detailed student profiles, generate registration numbers or matriculation numbers and correlate information from other modules. create and manage student time tables. Conflict checking for students, courses, teachers and venue. Send SMS reminders whenever required. Create and manage voucher and PINs that can be used for scratch cards. Sell scratch cards for fees, post UME, registration, etc. Create and manage transcript and testimonials for students. Manage certificates as well as track records of students peformance over time. Fully functional alumni platform for graduates to natwork with each other, keep in touch, plan events, and other projects. A payroll management system that keeps track of everything related to staff payrolls and financial account management. Can be integrated with Content Management Systems (CMS) platforms like Wordpress, Joomla, Moodle, etc for easy website creation. Multi access level for back end administrator. Account admin, dept admin, teacher, library admin, etc with restrictions. Very flexible. Can be self hosted on your server or hosted on our cloud. Can run online or on your local server and intranet. 2014-2016 © Copyright SupremeWEB Solutions Limited. All rights Reserved.